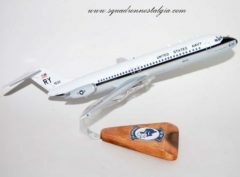 Fly again in this handcrafted wooden McDonnell Douglas C-9 Skytrain model. Each piece is carved from wood and handpainted to provide a piece you’ll love. 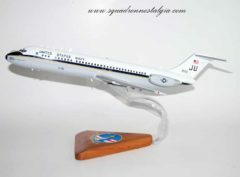 The McDonnell Douglas C-9 is a military version of the McDonnell Douglas DC-9 airliner. 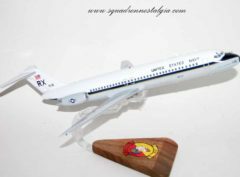 It was produced as the C-9A Nightingale for the United States Air Force, and the C-9B Skytrain II for the U.S. Navy and Marine Corps. The final flight of the C-9A Nightingale was in September 2005, and the C-9C was retired in September 2011. The U.S. Navy retired its last C-9B in July 2014. Two C-9Bs remain in service with the U.S. Marine Corps. 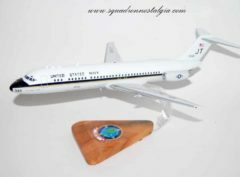 In 1966, the U.S. Air Force identified a need for an aeromedical transport aircraft and ordered C-9A Nightingale aircraft the following year. Deliveries began in 1968. 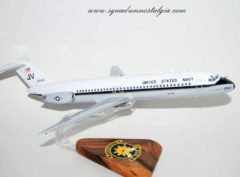 The U.S. Air Force received 21 C-9A aircraft from 1968 to 1969. The C-9As were used for medical evacuation, passenger transportation, and special missions from 1968 to 2005. The C-9A were named for English social reformer Florence Nightingale (1820–1910), the founder of modern nursing. After selecting a modified DC-9 for passenger and cargo transport, the U.S. Navy ordered its first five C-9Bs in April 1972. The Air Force in the early 1970s, under the Military Airlift Command was responsible for moving military personnel from place to place. The Navy documented to Congress that their people were being given last seating on Air Force flights. 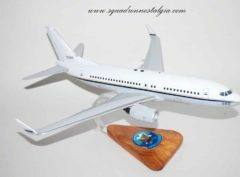 Congress authorized the Navy to fly its own passenger/cargo jets shortly thereafter. 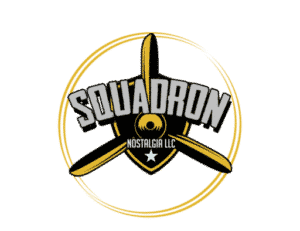 The C-9B aircraft have provided cargo and passenger transportation as well as forward deployed air logistics support for the Navy and Marine Corps. (The original “Skytrain” was the famous C-47 of the World War II era, developed from the civilian DC-3.) 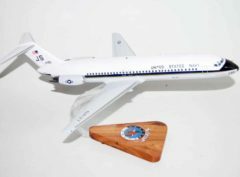 A C-9B was also chosen by NASA for reduced gravity research, replacing the aging KC-135 Vomit Comet. Many of the Navy’s C-9Bs had a higher maximum gross take-off weight of 114,000 lb (52,000 kg). Auxiliary fuel tanks were installed in the lower cargo hold to augment the aircraft’s range to nearly 2,600 nautical miles (4,800 km) for overseas missions, along with the addition of tail mounted infrared scramblers to counter heat seeking missile threats in hostile environments. The C-9B squadron (VR) were located throughout the continental U.S., with detachments operated in Europe, and Asia. https://en.wikipedia.org/wiki/McDonnell_Douglas_C-9ne Corps. 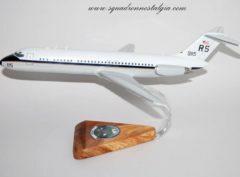 VR-46 Eagles DC-9 Model Fly with the Eagles of VR-46 out of Atlanta in this hand crafted model. Each piece is carefully crafted from wood and hand painted to provide a unique piece.